Copihue (pronounced Cop-ee-way) is a 74ft Andre Hoek designed modern classic sloop, built as an ocean going vessel to take her passengers around the world. She is named after the Chilean national flower, one of the most beautiful and graceful of vines. Likewise Copihue’s long flowing lines and natural elegance makes her, by popular opinion, the most attractive yacht in her class. Whilst in the UK this gorgeous yacht is based in the easily accessible Ocean Village Marina, Southampton, and is available for both day charters in the Solent or longer trips further afield. Team away days, entertaining clients or to simply enjoy the luxury of a relaxed sail amongst friends; this yacht lends itself to any experience. 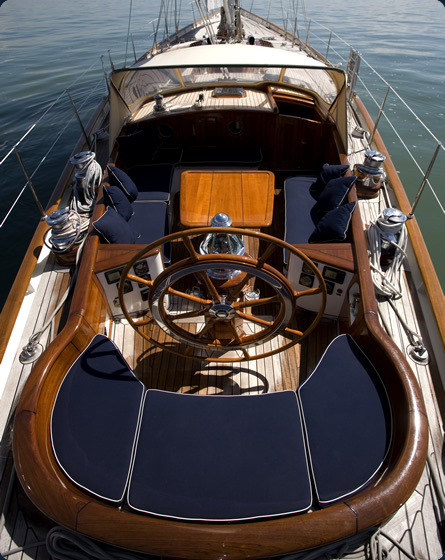 Feel the excitement on the helm or leave the work to the experienced crew, the choice is entirely yours – either way you will cherish the memory of sailing this modern day classic beauty.